There’s a lot of people moving around lately, especially to do their own little thing after working at a big successful corporation. An obvious example is with Hillel Cooperman, Walter Smith and Jenny Lam from Jackson Fish. The latest of these migrations is Chris Aarons, the friendly PR guy from AMD. 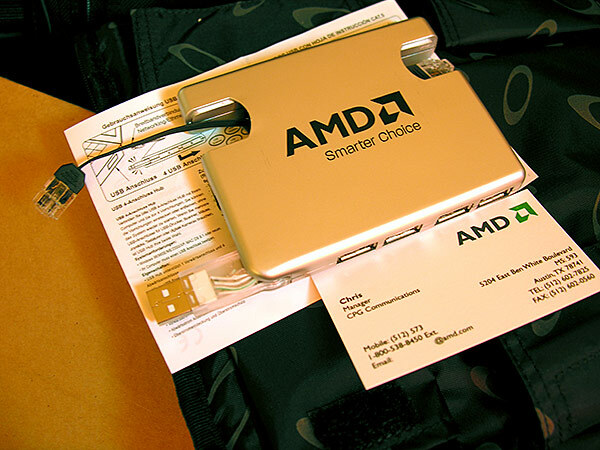 You might think you’ve never heard of Chris, but he helped put together the Vanishing Point puzzle, send out complimentary bags for CES, and provided many opportunities for bloggers to try out the latest technologies from AMD. It takes someone to send out a bag, but it takes something more to send your business card to complete strangers. I didn’t know Chris very well, and it hurts me to say I’ve probably caused him the most trouble during his career at AMD. Some of you might remember that little misunderstanding of generosity at December of last year, if you don’t, please don’t look it up. I cannot imagine how much trouble that incident might have caused Chris, but I sure didn’t expect him to ever interact with me again. But Chris did. Not only is Chris interacting with me, he’s even helping me. You see, I never got a computer, it’s a long story. I have a lot to thank Chris for. Of course, I’m not the only one with a positive experience with Chris. Michael from HardwareGeeks.com where I learned of the story originally also expressed his thankfulness to Chris, and so did Andru from GearLive. I wish Chris the best of luck with his new venture, Buzz Corps Inc. If any company needs a public relations expert who knows how to connect with bloggers, don’t go past Chris Aarons. Thank you for the kind words. And, while there was some controversy around the Vanishing Point seeding, you ended up showing everyone the power of blogging and social media. So, thank you and please, please don’t ever do anything like this again!!!! Having worked with Chris for several years and partnering with him while I was at MSFT on Vanishing Point, the x64 launch and more I can honestly say that AMD is losing a great person. Keep your eyes on his company… they’ll do great things.